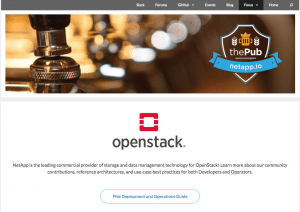 Have you visited NetApp’s OpenStack section of thePub lately? If not, you may have missed NetApp’s new and improved OpenStack Deployment and Operation’s Guide. 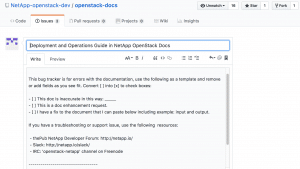 Now a living document, easy for you to read and for us to maintain, the Guide is your one stop source for all things NetApp on OpenStack. If you’re wondering about which technology to deploy? Check out the NetApp Systems and Software section. Need to reference configuration for your existing NetApp Cinder and Manila deployments? Take a look at the example files and configuration info under the Block Storage section (now featuring SolidFire!) and Shared Filesystems section. Well-organized and easy to navigate, the Pike Deployment and Operations Guide can be accessed directly here. As the Deployment and Operations Guide is a living, breathing document, we would like to emphasize that it is always being updated with tweaks and enhancements. We are working on a more streamlined notification system, but for the moment check back often to stay up-to-date with the latest changes.